The Secret Dealers competition is a fun competition based around the antiques valuation show and has similarities to Dickinson’s Real Deal, with which it rotates ,at around 3pm on ITV1 (repeated on ITV3). In addition to the nature of the show, this itv competition is similar in that it generally runs daily, with prizes being smaller than the morning biggies, but yet still often totalling to more than £20,000 in one week. The fact that there is a new competition daily, means there are more chances to win a smaller cash prize of a few thousand pounds. On occasions, the Secret Dealers competition groups all the days together and runs a bumper prize all week eg. a prize of £20,000 for which you can enter all week, as opposed to several smaller prizes. As you can see, the Secret Dealers competition often runs daily, with prizes in the region of £1000-£5000. As per usual, there is no need to stress about the difficulty of the competition questions – they’re always really easy A, B or C multiple choice on a simple subject. But if you’re having trouble then we’ll generally have the correct answer posted on our website. Comping has never been so easy! The Secret Dealers Competition is one of the itv.com competitions and therefore you can enter by a number of methods. Phone, text and online are most popular, however don’t get sucked into sending that text or making that call whilst sitting on the sofa…coz it’ll cost ya around £1.50! Eeek! However entry online is free and you can enter more than once. So take a minute to submit your entry online and save a few quid.! 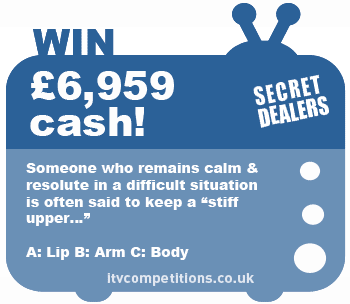 Here at the ITV competitions website we list all the TV competitions we can find, including Secret Dealers. So if you have difficulty finding the correct link or end up missing a show then just pop over here where you will find everything you need! 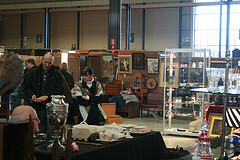 Basically a number of antique dealers come into your home and make bids for any items they like the look of. Meanwhile an independent dealer has also “advised” on a price range….this is kept secret.